Today I’d like to introduce Danielle Pamenter from La Di Dah Handmade Creations, who is mum to Brody (4) and Ashton (2.5) and based in beautiful Buderim on the Sunshine Coast. I had the pleasure of meeting her at the Sunshine Coast Marketing Between Markets workshop with Mamma’s Market earlier this year. 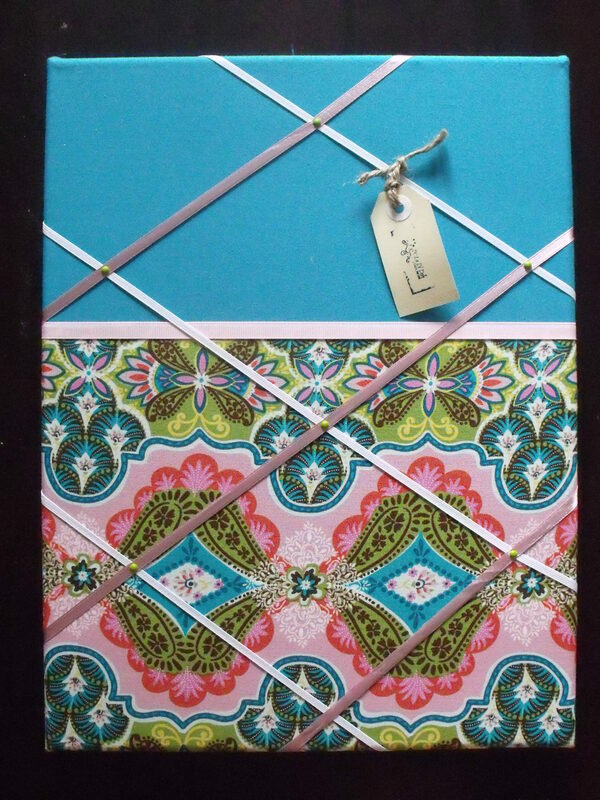 She started La Di Dah at the end of September 2010 and uses gorgeous fabrics and ribbons to create fabric memory boards which are useful for storing and displaying everything from photos to bills. They can be custom made to suit your decor and would be a beautiful addition to any room, and are very reasonably priced. I had a wonderful time browsing the beautiful boards on both her Facebook and Madeit pages, I love the option of adding in your child’s name. Danielle is kindly offering a special for our readers – order before 30 June 2011 and mention “Professional Parents Profile” to save 10% off any order. Facebook orders only. HOW DID YOU COME TO CREATE YOUR BUSINESS? 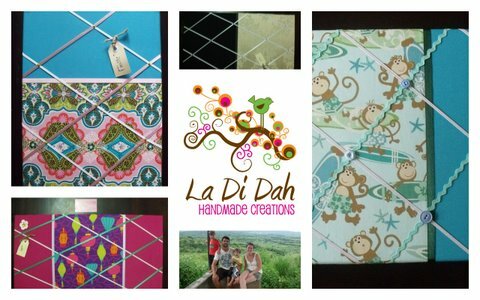 La Di Dah first was created when I started to handcraft items for my own home. I was very excited to find that my products were original and unique which then encouraged me to begin the business facebook journey. La Di Dah was a great ‘outlet’, for a stay at home mother of 2 boys, to have some ‘work’ time! Not only creating a business of my very own but having a ‘purpose’ and it was important for me to feel like a providing a little ‘cash flow’ for my family. HOW DOES THIS COMPARE TO “LIFE AFTER CHILDREN”? From a working perspective; Child Care is a high pace high demand job and going back to a full time position in this field just didnt feel right. Minding other children, then coming home to my own family wasnt on my list of priorities. So staying at home was a big change. Myself and Ryan stuck to a one wage family income which proved to be tricky at the best of times as well as ‘me time’ being a very special moment. As much as I LOVED being a mother; being stuck at home as a labelled ‘house wife’ for 3.5 years, just wasnt for me!! ONE OR TWO TIPS FOR WORK LIFE BALANCE: I try not to do any ‘work’ on our ‘at home with Mummy days’ as I feel the purpose of having my own business is to create my own flexible hours to suit not only myself but my children and husband. WHAT ARE ONE OR TWO OF YOUR FAVOURITE PRODUCTS (OR SERVICES) I love using my gorgeous fabrics, ribbons etc to create La Di Dah Fabric Memory Boards. I also love creating custom orders too; gives me a chance to work one on one with a client, create a relationship (even if its over emails) and stick to a challenge to create something personal. ANY PROFESSIONAL QUALIFICATIONS OR TRAINING YOU’D LIKE TO MENTION? DO YOU FIND THESE QUALIFICATIONS/TRAINING STILL RELEVANT NOW YOU’VE BECOME A PARENT? My qualification is: Diploma of Community Services, Children’s Services. (Group Leader in Child Care) so in many ways this has helped me as a parent, from being patient to ideas and strategies! WHAT WAS ONE OF THE MOST UNEXPECTED THINGS ABOUT BECOMING A PARENT? Becoming a first time parent was a very exciting time as well as life changing. Being a parent is more than a full time job, as sometimes labelled; its a full time multi-tasking job (cleaner, carer, doctor, organiser, cooker, shopper (for groceries), mediator, planner and of course the list goes on! But one thing I didnt expect was to ‘go on with life’ on 2-4 hours of broken sleep a night! This has made me (what I believe) a strong person, physically and mentally. WHAT IS ONE OF YOUR GREATEST WISHES FOR YOUR CHILDREN? To always provide a loving and nurturing environment for them and their development and to be able to help them experience life to the fullest by making them aware of all the positives instead of so much negative and be grateful for all that we have. AND YOUR BUSINESS? To continue to grow and create. And hopefully sell in stores/shops. ONE OF THE MOMENTS YOU ARE MOST PROUD OF IN THE LAST FEW MONTHS? 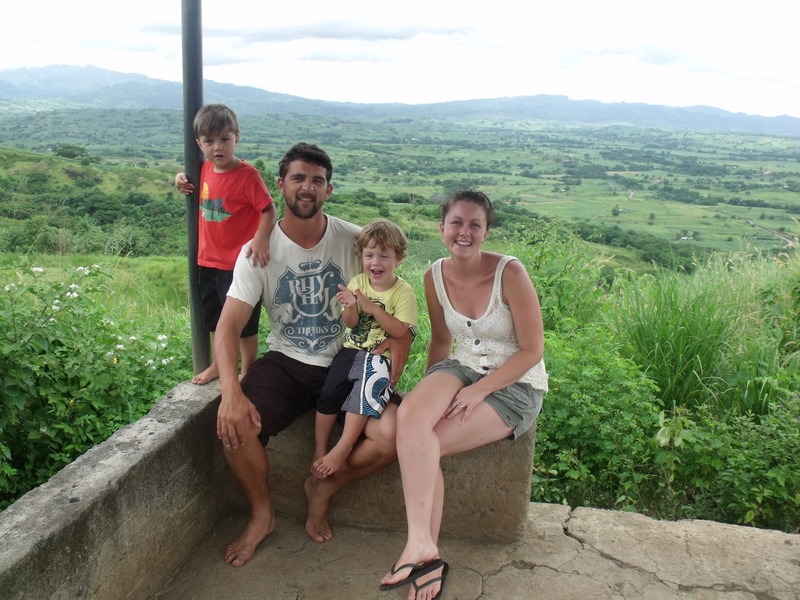 My Family and I went to Fiji recently and visited a very remote village (infact the last traditional village who still live in grass huts ‘bure’). This moment is something that ill treasure for ever!! It made me very proud of my family and country as well as extremely grateful. It has not only impacted life within my family but impacted my La Di Dah tactics and the reason I want my La Di Dah business to strive; enjoy every moment that the business gives and be grateful that I am able to create for my own business within my own time. Enjoy meeting customers and other people in the same position as well as being confident. WHAT KIND OF WORK DOES YOUR PARTNER DO? Ryan is a carpenter. ONE OR TWO OF YOUR FAVOURITE PROFESSIONAL PARENTS BUSINESSES: I think Erin from Sunshine Coast Work at Home Mums has built a fantastic business and resource for businesses on the Sunshine Coast. I also think the Ash Hoyle from Mm is for Me does a fantastic multi-tasking job; i love reading her blog! DESCRIBE YOUR OFFICE. Our office/study was an organised mess up until recently with the fantastic work of my husband building shelving for all my La Di Dah fabrics and bits n pieces. I love stepping into the ‘la di dah room’ and looking at it!! DESCRIBE A TYPICAL DAY – OR DO YOU NOT HAVE ONE? Every day is different. We have the normal breakfast, lunch and dinner routines although like to just take things as they come and not be so structured as such. We enjoy catching up with people, going to the beach, and chilling out at home!! WHAT DO YOU LOVE ABOUT BEING IN BUSINESS (OR BEING A WORKING PARENT) Flexibility and being able to create my own items and sell them to people; makes me grateful and very proud. DO YOUR CHILDREN GO TO SCHOOL/DAYCARE/ALTERNATE CHILDMINDING? HOW OFTEN? Yes, Brody and Ashton both attend daycare on a tuesday then monday Ashton goes and Wednesday Brody goes. This gives me a chance to be able to spend one on one time with them; which is soooo lucky and I really enjoy!! A huge thanks to Danielle for sharing her time and her talent, I’ve really enjoyed getting to know you better.